… but I may be warming up to it! On Monday, all of a sudden, my lower leg/calf area started to hurt as I was walking to work. This has happened to me a number of times before, and I think it happened on Monday because of my new sneakers. I think they must have different support than all of my other sneakers and my legs/feet haven’t gotten used to it yet. Whatever the reason, my plans of running on the treadmill after work went out the window. Womp. So, I did. And I didn’t hate it! I can’t say I loved it, but it was almost enjoyable. I think part of the reason why I liked it was because we did 45 minutes of spin and 15 minutes of abs- a nice way to break up the workout. Another reason why I liked it was because we did climbs and sprints based on the song, so it wasn’t just a 45 minute slow climb. Boringggg. Lastly, the bikes didn’t have knobs, but rather levers, so you could see what level you were at, as well as the RPMs and time, so when the instructor wanted you to change, she would say “Ok, bump it up to level 12, with RPMs between 90 & 100, and we are going to sit in the saddle for 30 seconds then bring it up to 3rd for 45 seconds and then hover in 3rd for 60 seconds.” Being able to measure the intensity, speed and time made the workout much more enjoyable. I always have a hard time when spinning has the bikes with the knobs and you’re supposed to do one twist to the right, two twists to the right, 1/2 twist back to the left, etc. Call it my Type A personality, but I like to know exactly how hard I am working and if I am on par with the class. My only issue, and I can’t believe I’m even saying this, was I didn’t leave there feeling like I had legs of jello. Don’t get me wrong, I was a sweaty beast by the end, but the only time I felt like I wanted to knock my level down lower than what was prescribed was when we had a 4 minute hill climb in the seated position. Holy crap. My legs were dead! Other than that, though, I felt like I could have worked harder… or that I could have done another workout after. Is that normal? When an instructor tells you what level to do, do you follow it or do what you need to do to intensify the workout? So, with all of that said, I think I am going to give spinning another shot. I really WANT to like it because there are so many sub opportunities for spinning at the gym, so it would be great to learn to like it, how to do it, and feel comfortable teaching it. It would certainly make me a more well-rounded instructor! Questions for you: Spinning- love it or hate it? What’s a tip you have for me to make sure I’m getting the best workout in that I can? 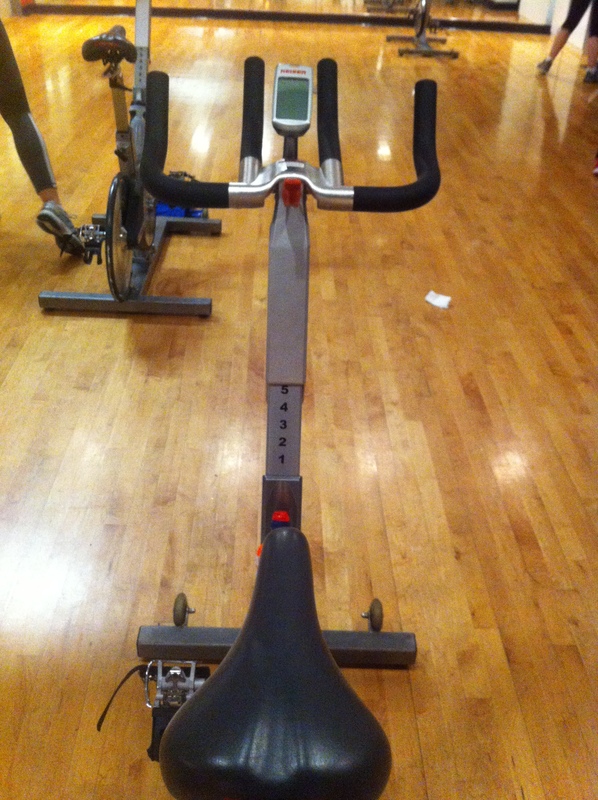 Where’s the best spinning class you’ve ever been to? Love love love spinning. We have different classes like All Terrain and Road Drills. They help me stay interested because they use AMAZING upbeat songs which keep you motivated till the end! I find the more ‘fit’ a person is (the less worn out they feel)…only because my husband is a huge hockey player (has jacked legs) and never seems to be as sore/tired as I am at the end of the class! lol. Those classes sound really fun! You may have a point there with why your husband isn’t as tired/sore, but my legs aren’t super strong… i think i just need to up the resistance more! So I think I’ve mentioned before that like you, I hated spin. I was on the cycling team at BC and loved our outdoor rides, but hated indoor practice. After you left Allston on Saturdays, I had to find a class to fill it’s spot, so I tried spin with Danielle and I LOVE it! Granted, she’s hysterical and makes it SO fun, but I simply never thought I could enjoy it. I think a lot of ot depends on the music and the types of riding you do. You should go to one of Danielle’s classes (George actually teaches an awesome spin class too) to see what she does. We do up and downs, sprints, hill climbs, etc and I usually torch about 700 calories. We don’t have the bike you pictured, but she uses resistance of 1-10 and you basically get used to it over time.